Scottsdale Ranch Park - Scottsdale, Ariz. 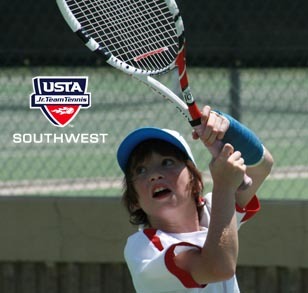 Junior tennis players will be out in force and looking for a shot at a Section team title when the USTA Southwest Jr. Team Tennis Championships take place August 1-3 at Scottsdale Ranch Park in Scottsdale, Ariz.
Fifteen different teams from across USTA Southwest cities including Phoenix, Flagstaff, Albuquerque, Las Cruces, Santa Fe and El Paso will each have squads participating at the tournament, rounding out four different divisions of co-ed team play – 12-and-under Intermediate, 14-and-under Intermediate, 18-and-under Advanced, 18-and-under Intermediate. Winners in 14s and 18s divisions also earn the automatic section bid to the USTA National Jr. Team Tennis Championships held Oct. 22-24 (14-and-under) and October 29-31 (18-and-under) at the Surprise Tennis & Racquet Complex in Surprise, Ariz.
Jr. Team Tennis is designed for kids ages 5-18. Kids are placed on teams or form their own through local parks, schools, or public or private clubs. Regular local team matches are typically co-ed, and top teams from local leagues advance on to Section Championship events. Hotel Valley Ho is the host hotel for the USTA Southwest Jr. Team Tennis Section Championships and also the site of the Hawaiian-themed Luau Player Party, Monday, August 2 at the hotel’s pool. The Frank Lloyd Wright-influenced Hotel Valley Ho has been the center of chic in Scottsdale since the 1950’s, and was once a hot spot for local politicians and socialites such as Marilyn Monroe, Bing Crosby and Betty Grable. Hanging out at the Valley Ho pool has been named one of the “Top 50 things to do in Phoenix” by the Arizona Republic. Hotel Valley Ho is located at 6850 East Main Street, Scottsdale, Ariz. Website is www.hotelvalleyho.com or call (480) 248-2000. Scottsdale Ranch Park (SRP) is one of the finest tennis centers in the Southwest. An 18-court lighted public facility, SRP has been named one of the Top 50 Tennis Welcome Centers in America, and is a past USTA Outstanding Facility Award Winner. For more information on the Jr. Team Tennis Section Championships, contact tournament director Michelle Moyer at mmoyer@southwest.usta.com or 480-289-2351 x. 104.